In our camera test, the LG G7 ThinQ has to prove that it can play first violin in the orchestra of the best camera smartphones. Our camera test will show what the camera in the G7 ThinQ is capable of. Note: LG provided us with a pre-production LG G7 ThinQ that served as the basis for this review. LG’s dual camera uses two identical sensors, the Sony IMX351, which has a resolution of 16 megapixels. The sensors are smaller than camera sensors used on other high-end smartphones. LG could make the camera compartment on the back somewhat smaller. The apertures are f/1.6 for the standard lens and f/1.9 for the wide-angle camera. The most important feature in LG’s dual camera setup is the wide-angle camera, which covers around 107 degrees in the LG G7 ThinQ. In previous generations this value was slightly higher, but LG wants to almost completely prevent distortions at the edges of images. This works to a great extent (except in the corners), but robs the photos of fisheye optics that make wide-angle pictures so interesting. All the nice technical data is of course of no use if the results aren't great. So let’s take a look at the pictures taken in daylight. The only thing to note here is that pictures with lots of sky require HDR mode and the backlight photography is extremely challenging. Many pictures look quite neat on the LG G7 ThinQ. LG colors are traditional and very strong, which is also noticeable in this device. The RAW mode is only available in manual mode. The RAW file cannot be saved in Auto mode. For a RAW vs. JPG comparison, we used the Open Camera app. This shows how much the camera software processes the sensor data to create the final image. The LG G7 ThinQ can have some issues with details, which might be the leaves on the trees, the walls in a house or other fine structures, depending on the situation. 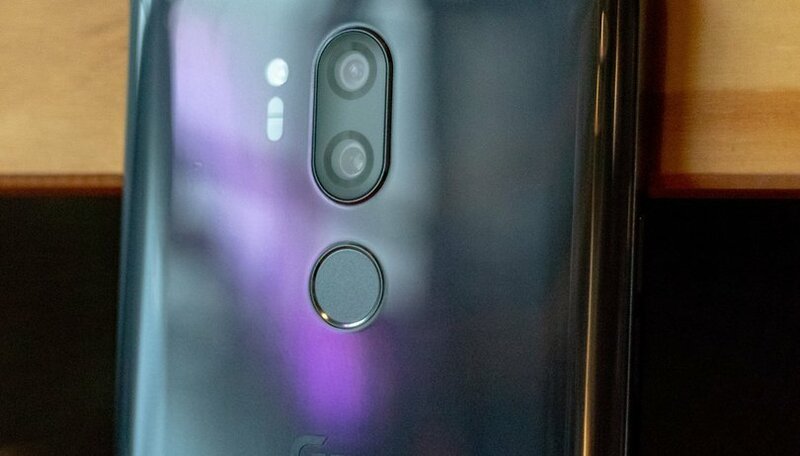 The G7 ThinQ tends to generate broad surfaces that have little to do with the original design. This is apparently where the camera software on the LG G7 ThinQ reaches its limits. These observations apply to both cameras of the dual camera setup, and the wide-angle camera generates somewhat less precise colors. In the evening hours, the G7 ThinQ gradually sharpens up the more intensive post-processing. Sufficient software filters ensure that the images only show low noise, but this is at the expense of the details. It is noticeable in the dim lighting that the shutter release times are sometimes quite long, especially when the G7 ThinQ thinks it has to release the flash. Unfortunately, LG hasn’t correct the brand’s biggest weaknesses. In terms of photography, the LG offers average quality. But that’s just one part of the truth: despite the smaller field of view, the wide-angle camera still offers interesting perspectives that other smartphones can’t represent in a photo. And often enough there are some things to criticize in the photos, but overall the photos are often quite successful. Whether a photo is pleasing or not is ultimately not so much determined by the detail quality of the photo, but rather by the photographer's ability and the viewer's demands. With the LG V30 ThinQ, LG pushed the story that the V30 is particularly suitable for videos. In our test, the V30 could not quite hold this claim. This is unfortunately still the case with the LG G7 ThinQ. The handling of the camera is still not very catchy. This starts with supported recording modes. 60 frames per second are only possible with Full HD. At 4K, however, it remains at 30 fps. Image stabilization isn’t available in 4K or in Full HD mode at 60 frames per second. This also applies to the various color filters or the cine video mode. The cine video mode allows you to change the color display in the video on your smartphone. So if you want to create non-shaky recordings, you’re limited to Full HD. A detailed description of the video mode will be provided later. LG didn’t change much in the camera app. The camera image can be seen in the middle, while three further camera modes are stored on the right, along with the release buttons for photos and video. The video recording starts immediately after you press the button, which I find practical. In the factory state, the LG G7 ThinQ takes photos in the aspect ratio of the display, i.e. 18:9.9. Although the photos look quite chic on the display, it can also be a hindrance. Users who switch to 4:3, but they will see an enormous amount of black on the display, since 4:3 doesn’t take up the entire space of the display. This format is much better suited for later processing. Switching between the two cameras is possible via small icons that can be seen in the middle above. The icons are still so small that changing modes without changing the focus isn’t always possible. LG has integrated Google Lens into the app. Three additional modes are now available in automatic mode: the AI Cam, the Portrait Mode and the Google Lens. In addition, there are other modes that can be selected on the left side, but which then hide the first three modes. The problem with the camera app is that LG has added more functions from generation to generation without putting them into a logical structure. This becomes painfully clear with the LG G7 ThinQ with its AI Cam. Google Lens helps you identify objects and get more information about them. Oh and by the way, Google uses the possibilities of the Assistant, so advanced web searches are quickly accessible here. Depending on the scenery, the AI Cam switches to a customized mode to take the best photo, at least in theory. In practice, this mechanism can have two weaknesses. The object recognition is quite slow and too often the AI Cam isn’t sure whether the blueberries in the viewfinder should really trigger the food mode. If the AI Cam finds a mode, it is often too bright. Photos of buildings often benefit from the AI Cam in my test. With plants and food, the result is often still bearable. It is difficult with modes for children or animals, where the settings aren’t very convincing. After a few attempts, I usually deactivated the AI Cam because the results were too unreliable and the regular automatic mode often delivered the more useful photo. Keywording is a wonderful feature. In our first tests, this only worked with images taken with the AI Cam. After two software updates, however, this feature is available for all images on the phone. This means that in the gallery app, LG sorts all photos through different tags, meaning either buildings, leaves, etc. With Google Photos you have to search manually for this feature, which is less clear. Technically, LG has made the wide-angle camera worse. On the one hand, it now uses a higher resolution sensor, but on the other hand, LG has reduced its image coverage, which is at the expense of the camera’s photographic options. The wide-angle camera still perceives more of the surroundings, but the difference is no longer so clearly visible. The wide-angle camera remains the highlight of the LG camera design. It opens up the variety of available perspectives and therefore considerably expands the photographic horizon. The camera itself still suffers from the comparatively poor image sensor. This is particularly noticeable in the representation of details, such as tree leaves. Furthermore, the LG G7 often doesn’t ideally capture the backlighting situation. Overall, the camera on the LG G7 is more of a weakness than a strength. The competition in the price range is more reliable in creating the best picture given the circumstances. This is what LG urgently needs to rework in future devices, since the camera quality isn’t sufficient for its price segment. What is your favorite smartphone camera? How do you think the LG G7 measures up? I've only had the G7 for a few days, but I can't find anything to REALLY disagree with in the article. The shutter response can be painfully slow - the AI needed is on the human's part, trying to predict the future and pressing the shutter button far enough in advance to capture what's about to happen vs. what IS happening. And having strayed from LG since the G4, I can say without a doubt that they have done absolutely nothing to improve their image processing. They still look like pointillism paintings when you zoom in. The details are absolutely lost. Overall, it's not a BAD phone by any means, it just doesn't really offer anything spectacular to sway people from its competitors. Overall performance feels better than the Huawei P20 Pro - but Huawei, I believe, has the better camera here. I'd have honestly thought about the Galaxy S9, except I hate their curved displays more than notches or LG's sketchy QC (in the past) and general lack of software updates. I'll honestly probably pick up a OnePlus 7 in the spring, and give the G7 to my daughter.